Glowing beacon WE ARE THE CATALYST sparked in 2012 and continues to illuminate paths for the lost and weary several years later. Standing as a patron saint for those who wander in the dark, Cat Fey sings (at times serious and terrifying, at others patient and comforting); her voice ringing with the crystal clarity of a guiding soul that has no doubt gone through the same dark paths at one point or another in their life. Their third full-length release "Ephemeral" sounds like a return to form from their debut album "Monuments" after experimenting with harsher vocals on their sophomore "Elevation". WE ARE THE CATALYST seeks to enlighten and uplift spirits from their opener, "Over Pale Waters". The band builds an atmosphere that insulates from the slings and arrows of the rest of the world for a while. There is this sense of invulnerability; of new-found pride. Cat Fey is right at home in her element. 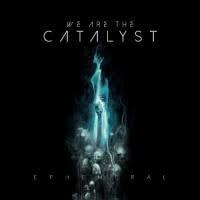 Channeling I CINTILLA's explosive "Optics" or EVANESCENCE's classic "Fallen" album, WE ARE THE CATALYST's "Ephemeral" is rife with those classic, Alt-'00 anthem elements of crisp, clean vocals and harmonies of guitar and synth chords that are easy to let get under your skin. You know, the kind of songs that you lost yourselves in, perhaps during your earlier metalhead days? Plus, I dare anyone not to feel invigorated in spirit for the entire duration of "Where the Mountain Stands" or "The Code". "Innan Allt Faller" is hefted down with miles of razor wire bass lines and angrily yelled in the band's native Swedish tongue. Final track "Dust" is a subdued and introspective end to such a fierce album. WE ARE THE CATALYST has fulfilled their purpose to be a guiding light in the dark and then some with this release. "Ephemeral" showcases the beautiful sides of the shadows and to never be afraid of them.